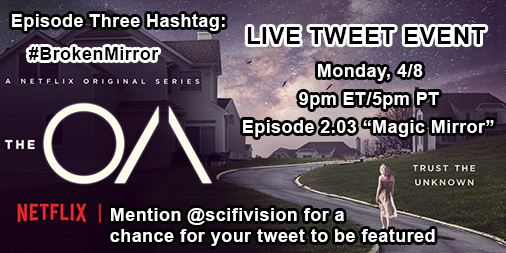 After a better response for episode two, we're coming together once again for a live tweet event for episode three, "Magic Mirror". Please take note of the time change and new weekly hashtag. When a streaming service drops episodes of a series, it's hard for fans to know when to tweet; not everyone watches the whole season at the same time. Sometimes selected times are scheduled. SciFi Vision has decided to host its own fan events for the series. It would be great if you could join, but even if you can't, reposting would be very helpful to help spread the word. Not as many people knew about the first one, but since then, people have responded, and we have already received quite a few RSVPs. The event for the third episode will take place Monday, 4/8 at 9pm ET/5pm PT. A Twitter RSVP would be appreciated! We also have started discussing the episodes in depth via our podcast Fandom Access You can listen to the newest episode here. The OA discussion starts in the second hour. Read on for the full instructions (it's a bit different this time) as well as what a live tweet is if you have never participated in one before. A live-tweet is when fans (and sometimes the cast and crew) post comments, opinions, and sometimes memes about an event (in this case a television show) on Twitter while it's happening in real-time. It usually takes place during the first airing of a show during one or more specific time zones. When there isn't an official air date because it's on a streaming service, it sometimes is scheduled at a specific date and time. A unique hashtag (this time #BrokenMirror) is chosen to use during the event to try to get it trending and also for the purpose of being able to follow that particular conversation only. We have decided this time to use it along with official hastags for more promotion, so hopefully more people see it. Also, please tell as many people as you can about it! Be sure to tag @netflix and/or @the_oa in your tweets when you can so they will see your tweet as well. If you tag us, @scifivision, you may get your tweet featured! If you think you are able to join in, we would love it if you could let us know in advance either by sending a tweet or DM, or just by responding to one of ours (though the preferred way is with a RT with comment so it shows on your timeline). We are just trying to keep a tally and also make it easier for you to stay informed. We also now have a group chat we have put together on Twitter if you want to discuss the event/the show. Just let me know if you want to join it, but be aware it's fairly active at certain times of the day.